Is Your Strategy on Target? How many times have you seen businesses fall short on delivering and sustaining results? Research shows us that the failure is not usually the result of poor strategy; failure is usually the result of poor strategy execution. 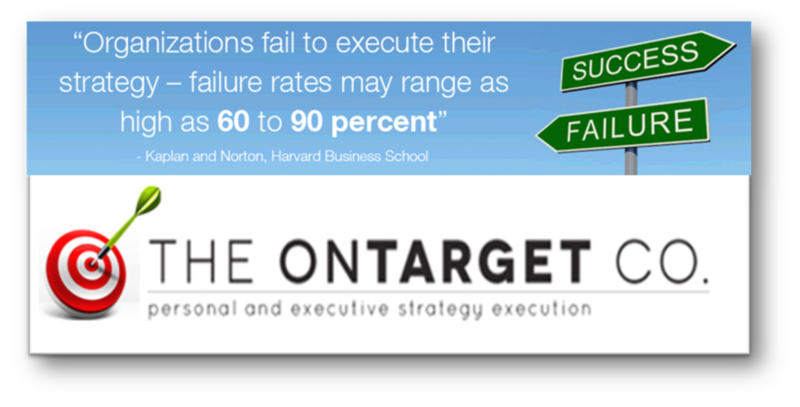 "Organizations often fail to execute their strategy-failure rates may range as high as 60 to 90 percent." Let's face it, we all fall short of our target every now and again, it's just part of life. So, perhaps the better question to ask is how can we improve our performance? I have pondered this daunting question for much of my career and would like to humbly share some of my findings and observations based on years of study and experience gained while working or consulting with Microsoft, Teradata, Delta Air Lines, Merck & Co, UPS, Coca-Cola and others. Those that consistently succeed tend to plan their work and then they work their plan following a strict and consistent approach; they follow a methodology. Regardless of industry or company size, this seems to be a key formula for success. Think of the converse; without clear vision and direction, and a system for getting things done, we all seem to drift along, aimlessly consuming our most finite and precious gift ... our time. I have had the privilege of meeting and working with some extraordinary leaders and organizations. Through my experiences, I have come to believe that there is a common approach to improving performance which consists of three distinct elements of work: Strategy Formulation, Strategy Execution, and Measuring Results. Simply stated, Strategy Formulation is the process of defining what you are going to do in no uncertain terms, outlining the tactics for how you are going to do it, and determining your measures of success. Strategy Execution can be described as putting your Strategy Formulation plan into action by actually taking the steps required to achieve your objectives (i.e., doing the work). Performance Measurement can be described as keeping track of where you are on the journey from your current state to your desired state and taking corrective action as appropriate to keep you moving toward your objectives. This approach has been proven to lead to sustained success over time. As with everything in life, there are no guarantees of success; however, if you follow the above, your probability of success will dramatically increase. Over the next few week, I’ll drill down on the steps above. Please follow the series, “like” and pass along to others who may benefit. I hope this helps you to get and keep your Life and Business OnTarget!